The new Raspberry Pi 3 freed us from having to use a WiFi and/or Bluetooth USB dongle, and for many people all that it was left missing was a hard drive. 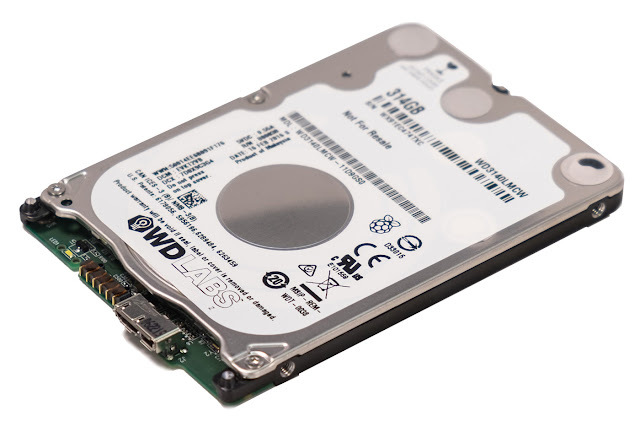 Well, WD just took care of it, with this 314GB PiDrive. The Raspberry Pi is perfectly suited for applications where a microSD card is perfectly adequate; and you could always use an external USB drive should you require it. The problem is that the RPI didn't provide much power over its USB ports, meaning you had to use a powered USB hub. Hence the creation of the WD 314GB PiDrive for the Raspberry Pi. WD carefully created this drive so it could be powered by the RPI USB ports alone, and still provide the maximum level of performance allowed by USB ports. It also includes a special version of BerryBoot which allows an easily management and selection of multiple operating systems during boot. The PiDrive will cost $45.81 but you can get it at launch at a more appealing price of $31.42 - so, don't dwell too much on it. For those uses where you need extra storage space or require constant writing of data (something like video-surveillance) that aren't suited for memory cards, this is definitely one option to consider.